Chris Thile moves at a musical pace most of us simply can't comprehend, and one gets the sense that the challenge of what's out there to discover gnaws at his brain. Bluegrass, Classical, Brazilian, Celtic, Rock, Middle Eastern and more. He's always hungry, and it's the need to continually search for answers that makes musicians of every genre and instrument excel in their craft. With Thile, he seems to devour that challenge. Chris' new CD "How To Grow A Woman From The Ground" was recently released and the supporting tour was under way when the interview was completed. The new CD coupled with some exciting new gigs with major classical performers such as Hilary Hahn and Edgar Meyer, and solo performances in New York City clearly indicate Thile is excelling and enjoying his corner of the mandolin world. Thanks, Chris. Here's to your bright future, and good luck with all that you do, and thanks for the tip on using the Wegen pick in question #9 ;). Mandolin Cafe: We love this new project. What new freedoms have you found doing a bluegrass disk away from your first band? Chris Thile: Embracing my foundation as opposed to feverishly adding onto it. Studying the foundation has brought my vision into focus: where I want this project to go and how I want to approach my career. Previously, I felt constrained not really understanding the structure of my domicile. Embracing the study of the foundation with this group of musicians has been liberating in that respect. 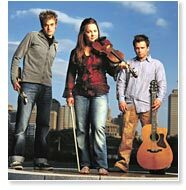 Mandolin Cafe: Billboard Magazine recently reported (August 28, 2006) that Nickel Creek will end their run next year. This seems to be a year of changes for you. Chris Thile: Yes. Nickel Creek has been together since I was 8 years old, and it's always been such a healthy creative environment. The preservation of that environment, even if it means stepping out of it, is very important to us as a group, and that's why we're doing just that. We felt if we continued to inhabit that environment, we ran the risk of compromising some of its beauty, and after a certain point, we would have sucked it dry. We need to let this field lie fallow for a period of time. Then, if the ground is ready to be sown, and we have the seeds, we'll come back to it. Mandolin Cafe: The CD was recorded live with two microphones and it's a raw sound we really like. Will you attempt to emulate that sound for the tour, and if so, what will the sound set-up consist of? Chris Thile: We will use a similar set up, but it's not because we're focused on re-creating the record as much as it's just the way we like playing. We're trying to make the audience feel like they're seeing and hearing us in a room gathered in a circle. Two mics are set up for getting the sound of the instruments together in the room, the clip-on condenser mics provide the bed, and the two central mics pick up things as we step in. We mix ourselves. And Dave Sinko our engineer knows when to delicately boost a particular part so that we don't lose it - the guitar solo for example. Mandolin Cafe: With 50 minutes of recorded material, that leaves another set for a typical concert. Any hints on what fills in that gap, or is that still under consideration? Chris Thile: We have definitely filled in the gaps! There were songs that we considered for the record that didn't end up fitting with the rest of the material, but provide great relief in the live show. Our first shows were pretty long; we've pared the set down a little. We're drawing additional material from my previous two solo albums : All Who Wander Are Lost and Deceiver. We also take a song to turn the spotlight on each band member - I'm really pleased with the flow of the show right now. Mandolin Cafe: There's an extended passage in your composition "The Beekeeper" where the band drops out and the banjo is soloing, followed by the fiddle then mandolin joining in unison and the rest of the band playing sparsely. It's a very powerful moment. Was the piece written with that in mind or did that arrangement come about spontaneously during rehearsals? Chris Thile: It actually came about in rehearsals as a group arrangement. I had the idea for that lick, the basic theme of that lick. I had that, and I wanted to incorporate it into the song somehow. It's a great example of the beauty of this band and how well we fit together. That song, more than any, represents collaborative arrangement under a leader. It was very refreshing. The Eleventh Reel is similar. Gabe suggested the concept - the way the melodies trade off was a suggestion of Noam's. I didn't think it would work, he said let's try it, and it did. 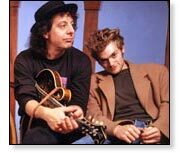 Mandolin Cafe: You once commented in a performance with Mike Marshall that you both were "just riding the mandolin gravy train." It was a humorous comment and got a good laugh, but are there times you question mandolin as your choice of instrument? Chris Thile: Mike said that. The short answer is absolutely. Piano and violin are superior instruments in regard to both technical possibility and range of expression. But the very exciting thing about mandolin is the unexplored territory. There have been great players, but the number of players that are truly pushing the envelope is small. Even if it's not the most economical way to get sound out of a string or a hunk of wood, it's my voice. It's what I'm comfortable on, and what I'll always play. I'm happy to be a mandolinist. Mandolin Cafe: You're also both known to share an interest in the development of a new type of mandolin. Does this revolve around a new construction material, or are there other functional and structural considerations that interest you? 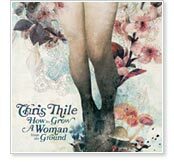 Chris Thile: I've given it up. I would always talk about it with Mike, but I always said that I loved the tone of the F-5. I was always playing devil's advocate. The problem is not the construction of the mandolin, but plectrums. Using picks. Picking is the problem, not the mandolin. Mandolins are beautiful, and they're as loud as the best dreadnought guitars. Picks are an inferior way of producing sound from a string as far as getting volume. We'll have to play in situations that it cuts through the other instruments. The bluegrass quintet is the perfect example, as long as the fiddle and banjo players are playing considerately. Mandolin Cafe: iPod, laptop, home stereo system. What would we find you listening to right now? Chris Thile: Sadly, my stereo got trashed in my cross country move. My iPod got left in a rental car. I'm listening to a Sony Discman these days. But I have killer headphones! Mandolin Cafe: Mandolin players would never forgive us if we didn't ask you to describe your Dudenbostel mandolin setup and amplification in detail, and any other mandolin family instruments you're using at the moment. 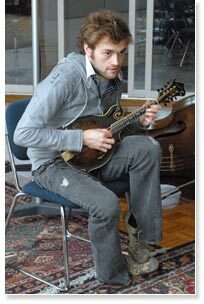 Chris Thile: I play Dudenbostel #5. I have the most sissy boy set up there ever was. That is, very light action. I use prototype Elixir Nanoweb strings. The Wegen TF 140 pick. The pick has seven speedholes that you can cover or uncover depending on how fast you want to play. I have a Lawrence Smart mandola, but I'm not that happy with the current set up, and a Flatiron bouzouki. Dave Harvey is my set up God. I strongly recommend people use luthiers that play well. It makes a big difference. Mandolin Cafe: You're approaching 25. Any predictions on your music at 50? 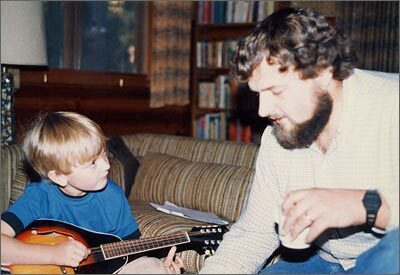 Chris Thile: At 50, I hope to have been progressing and to continue to progress. But in the coming years, the tension's mounting, boys.